June 15, 2015 marks the 800th Anniversary of a revered event in English history. In 1215, at a placed named Runnymede, England’s King John accepted demands of English nobility that he agree to rules defining the relationships between the king and the nobles, and among the nobles themselves. 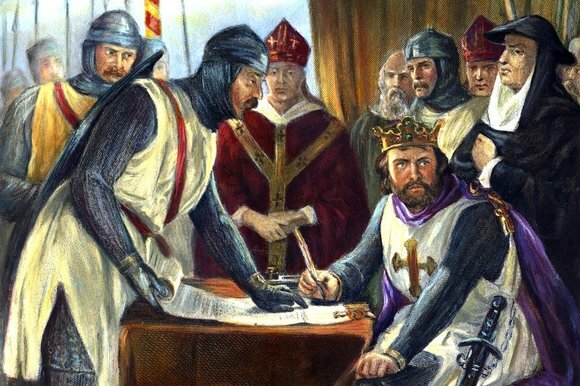 This agreement is known as the Magna Carta. The phrase “law of the land” would, over the centuries, become “due process of law”. 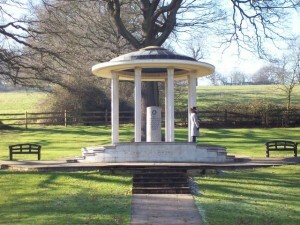 The Magna Carta’s idea that a person should not have his property or liberty taken by the government except by pre-existing law and procedures has become known as the “rule of law”. This means that there must be established procedures and laws in place before someone suffers a loss at the hands of the government. Additionally those laws and procedures are to be administered by an impartial third party. The magnificent Latin name “Magna Carta” is a bit less impressive in English. Translated the term means: “Big Paper”. The document had indeed been written on very large piece of paper. King John had not set his royal seal to the Magna Carta willingly. John sealed that large piece of paper surrounded by the unsheathed knives of his own barons. In the period before he accepted the Magna Carta, John had been imposing taxes on the English nobles to recoup his losses from an expensive and unsuccessful war with France’s King Philip II. The baronial families responded to John’s taxes by occupying London with their own knights. The barons sought neither independence nor freedom for England’s population. They wanted a peace treaty with John that confirmed their place at the top of the English feudal system. The result was Magna Carta, an agreement between the members of England’s top 1%. It was not very effective in keeping the peace. Having signed under duress, John was not ready for Magna Carta’s limits on royal authority. A short three months after assenting to the “Magna Carta”, the king pressed Pope Innocent II to annul the “shameful and demeaning agreement” that had been “forced upon the king by violence and fear.” The Pope issued the annulment and civil war followed. The war only ended when King John died of dysentery in 1216. 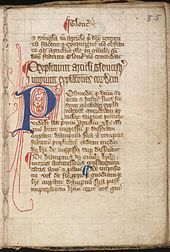 With the original Magna Carta annulled by the pope, its recorded ideas lie largely dormant as English history marched on. Chapter 39 did find life in a 1354 English statute providing: “[t]hat no Man of what Estate or Condition that he be, shall be put out of Land or Tenement, nor taken, nor imprisoned, nor disinherited, nor put to Death, without being brought in Answer by due Process of the Law.” This statute borrowed from the Magna Carta and changed “law of the land” to “due process of law”. Though the document itself had been declared ineffective over 140 years earlier the idea lived on. 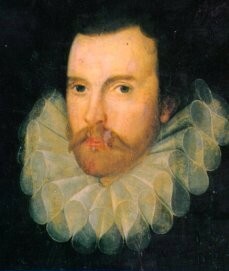 In 1613, a brilliant lawyer, Sir Edward Coke, became Lord Chief Justice of England. 400 years after the Magna Carta, the power struggle between then King James I and Parliament was reminiscent of the struggle between King John and his barons. As Chief Justice, Coke was the top legal authority in England and looking for a way to enhance the authority of the courts. The original Magna Carta had been written in Latin. Coke, a learned man, was fluent in Latin. Before his court came issues that could be decided by terms of the long dormant Magna Carta. Coke began invoking the Magna Carta and advised King James (who was unable to read Latin) that the document remained in effect and that it limited the power of the king. Coke revived the old “Big Paper”, the concept of the “rule of law”, and the idea that matters had to be resolved by the “law of the land”. Coke would become a prolific writer on English law. His Institutes of the Laws of England, were widely read in the American colonies and well known to America’s Founders. 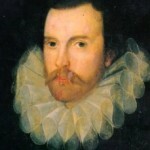 As the American colonies began to govern themselves, guidance for establishing their legal systems were often found in Sir Edward Coke’s writings. In 1641, Massachusetts adopted its Body of Liberties, providing that its citizens could not be arrested or deprived of their “life” or “honour or good name” except by “by vertue of equitie of some expresse law of the Country[i] warranting the same.” By the end of the seventeenth century, some form of the Magna Carta “law of the land” provision had become part of the laws of most colonies in British North America. On May 4, 1776 Rhode Island formally severed its political ties with Great Britain. The other colonies soon followed culminating in the Declaration of Independence on July 4th. These newly independent states adopted new constitutions for their governments. Delaware, Maryland, Massachusetts, New Hampshire, New York, North Carolina, Pennsylvania, South Carolina, Vermont, and Virginia all included “law of the land” or “due process of law” provisions in their original constitutions. When the Constitution was sent to the states for ratification in 1787, it contained neither a “law of the land” nor a “due process of law” provision. The lack of a clear statement in the Constitution that the new federal government would be bound to follow the “rule of law” and the lack of a Bill of Rights were major objections made by opponents of the Constitution. The Constitution’s supporters promised to address these issues if the Constitution were ratified. 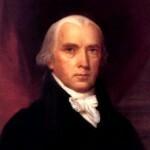 The First Congress, led by James Madison, kept that promise and the Fifth Amendment’s Due Process Clause became part of the Constitution in 1791. The promise that King John did not keep, that the Barons would be governed by a set of predetermined rules subject to an impartial decision maker, was promised to the American people by James Madison and the First American Congress in 1791. As a result, the American government today remains bound to provide every citizen with “due process of law” according to the “law of the land”, 800 years later. The Fifth Amendment originally applied only to the federal government. The Fourteenth Amendment has a Due Process Clause that applies to the states. The term “freemen” applied to the nobles. It was not meant to include most peasants, serfs or cottars. [i] The “Country” referred to was Massachusetts. This type of thinking would also have long term effects for the United States.